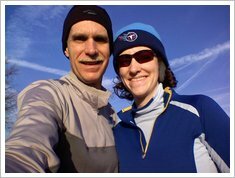 The temperature was in the mid-30s when Amy and I left the house a little after 7 am for the Habitrot 5k this morning. It was a beautiful morning, blue sky, sunny and a light wind. A perfect morning for a race. The Habitrot is held at the local mall and benefits Habitat for Humanity. We get to run around the mall a day before everyone else runs to the mall. We parked and headed off to get our timing chips. (I had picked up our race bibs and t-shirts on Wednesday.) Made it back to the car and stashed my warm up paints and jacket, snapped our annual photo and headed to that starting line. As we waited, we spotted one guy dress up as a turkey and another as an indian. Didn’t see any Pilgrims. Also, spotted my friend David S.
We lined up near the front but when the gun went off. We walked to the starting line. Once I crossed over the line, I couldn’t find any room to run. This race attracts a lot of families and people who want to do something for a good cause on Thanksgiving. For that I am thankful. But it also makes the start of the race rather congested due to the lack of etiquette. I was able to work my way to the outside of the cones that divided the road and quickly got up to speed. Mile 1 was more or less flat (7:18). Mile 2 had some elevation changes(7:30). The last mile was flat (7:19). Just before the first mile marker, I passed the turkey and the indian. I crossed the finish line in 23:01, a new PR by 10 seconds. I grabbed a cup of water and headed back out to run in with Amy. With about a 100 yards to go, she took off and sprinted to the finish. Her time was 32:12. At the finish line, I saw David S. again. Last year he called me later in the morning to tell my that I had placed third in my age group. So I asked him if he would pick up my award if I placed this year. Spent the rest of the morning eating and cooking with Gayle. It was good to have all the girls home for Thanksgiving. Happy Thanksgiving all…for one of the things I count as a blessing is my blog friends. This entry was posted on Thursday, November 27th, 2008 at 5:42 pm	and is filed under Race Reports. You can follow any responses to this entry through the RSS 2.0 feed. You can leave a response, or trackback from your own site. Congratulations on the PR today. Good race. It was a little cooler in Richmond at 7 — 22° when I headed out at 7:05 but rose to a blistering 24° when I finished 50 minutes later. Brrrrr! Nice effort, with the congestion at the beginning. Congrats on the PR and the AG award. Nine days and counting to Memphis. Will it warm up a little by then? Boy, the two of you look oh so fit on a cold sunny day!!! Congrats on the PR…those are some very solid splits. Good for Amy working hard and finishing with you!! The AG award is good…put that up prominently somewhere! 9 days…you are so ready!! What a great start for thanksgiving. Hope the rest of the day went just as well. You are going to do so great at memphis. Wish I was going with you. Congrats on a GREAT race on Thanksgiving!